A Highwayman was not someone you’d want to bump into on a dark night! In this workshop Cath Howe uses her two books, “The Curse of the Highwayman” and “The Highwayman’s Revenge” as a springboard for creative writing in KS2, using her experience in performing, teaching and writing. Ties in beautifully with teaching of the poem, “The Highwayman” by Alfred Noyes. "Thank you for coming to our class. The children were very excited by the props and loved the glove." "Absolutely magical! Captured the Year 5 kids completely. Want to dramatise it if possible. Great use of props- one child is now crafting a ‘gadget glove’- inspired by the haunting of the Highwayman’s glove." "Great session that allowed my children to enter a rich world of literature. 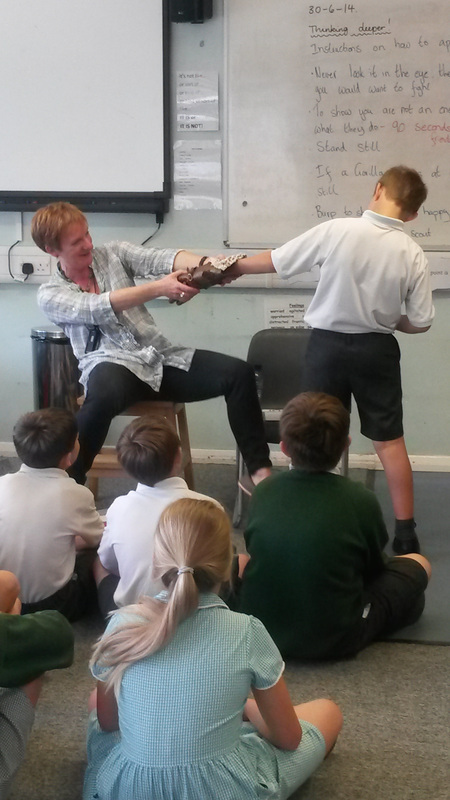 Cath’s talk on her highwayman novels inspired my Year 4 class to think about books and words. They were enthralled by the idea of such wild brave scary men. Her use of interesting props brought her story alive, especially the creaky old leather gauntlet and intriguing old metal box. Through skilful questioning, Cath encouraged the children to develop their own ideas. This was a lovely enrichment session." ﻿“This really enhanced our topic on “Letters and Authors” Two boys started working on their own chapter book the next day!